Liczba stron: 74 Jest to ujednolicona liczba stron, która ułatwi Ci porównanie długości książek. Każda strona Legimi to 200 słów. 303 Vocabulary Words You Need is precisely what you're looking for: the best and quickest way to build a smart and powerful English vocabulary. Published by Winn Trivette, MA, 2018. While every precaution has been taken in the preparation of this book, the publisher assumes no responsibility for errors or omissions, or for damages resulting from the use of the information contained herein. First edition. July 10, 2018. Copyright © 2018 Winn Trivette, MA. Written by Winn Trivette, MA. Few activities are as delightful as learning a new vocabulary. 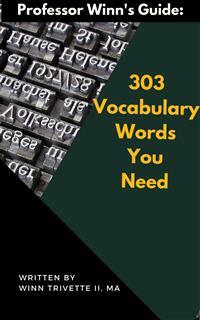 303 Vocabulary Words You Need is written to quickly and easily give you a broader and richer word power. Research indicates a powerful vocabulary is a predictor of both personal and professional success. Unfortunately, a strong vocabulary is a persistent problem for many students of English (and native speakers!). Rightly or wrongly, your friends, colleagues and clients judge your intelligence and competence based on the vocabulary you use. 303 Vocabulary Words You Need provides you a sophisticated lexicon which can be used in conversations as well as documents. Remember, income and vocabulary size are correlated. That is, every word you add to your vocabulary is like an investment in your bank account. Get started today to increase your word knowledge as well as your personal and professional success at the same time! 303 Vocabulary Words You Need will help you not only increase your vocabulary, but also allow you to use sophisticated English confidently in a variety of situations. This book is designed for easy self-study. Each of the 30 lessons can be completed in a single sitting, approximately 20 minutes. The guide is a perfect companion to your English studies in the classroom. Plus, you get a three bonus words at the end of the text! Each lesson includes ten (10) keywords drawn from everyday life. These words are defined and relative parts of speech and usage are provided. Exercises follow these definitions. Each is designed to test your comprehension of the new words and to illustrate their use in context. You will find the solutions to these exercises in the back of the book. A special bonus section below is 10 Tips to Successfully Grow Your Word Power. These are tips drawn from my years of experience teaching vocabulary to my students. The 30 vocabulary lessons are divided into 10 sections with three (3) sub-topics. Don’t forget the 3 extra terms at the end of the book to further expand your lexicon! If you need to strengthen your English skills – either for a promotion at the office or prepare for the IELTS or TOEFL exam, reserve your class today with me – Professor Winn! 1. Read, read, and read! Read extensively and find thousands of new words and grammar patterns, which help you predict what words, may come next. 2. Establish a routine and stick to it! Build a stronger vocabulary word by word and day by day. Practice routinely. 3. Keep a vocabulary notebook. Write all words, definitions, synonym, antonym, and related words. 4. Create flashcards online. Review your new words every week. 5. Learn new words in context. Research shows most words are learned from context. Copy the sentence or short part of the paragraph into your notebook where you found the word. 6. Make associations with the words. Connect your new words with pictures or with other words, events, professions, etc. 7. Take vocabulary tests online. Find out how much know so far. Measure your progress and make adjustments to your study routine. 8. Make sure you pronounce the word correctly. Visit an online dictionary and usually you have the opportunity to click and listen to the pronunciation of the word. 9. Play word games like Scrabble or Boggle online. Even consider crossword puzzle. Any word game forces you to rely on your recent study of words. You may even learn new ones! 10. Get excited about words! Building your vocabulary is a lifelong practice. Be curious about words and how you use them. A good vocabulary will help you obtain both personal and professional goals! The bank is committed to the accretion of shareholder value. The amortization of the candy-wrapping machine saved the company a lot of money. The farmer used his house and farm as collateral for the bank loan. Bartolo Brothers is always looking for dynamic new associates. 5. escrow – n - a deed, money, or other property held by a neutral third party for a specified period or until the occurrence of a condition or event. The landlord deposits our rent into an escrow account. First City Bank warned the diner of foreclosure if payment was not received by noon today. L&L Computers decided on outsourcing for its technical support department. The proprietor of the diner did not pay the bank loan. If Twisty Dip Ice Cream does not increase revenue, it will have to fire employees. Babble Electronics used over $1 million in venture capital to create a new smartphone. EXERCISE A. Complete the following sentences with the best word from the list. Use each word only once. 1. The startup firm desperately needed ___ from investors to expand. 2. Marta was ___ in the meeting with the client by answering all of their questions without notes. 3. Henri planned on the ___ of land value in order to gain any profit. 4. The small accounting firm just was unable to increase ___ to avoid (5.) ___ from the bank. EXERCISE B. Choose the word from the list that best expresses the opposite meaning of the word or phrase below.